Need an easy summer BBQ meal that’s fast to prepare and won’t weigh you down? 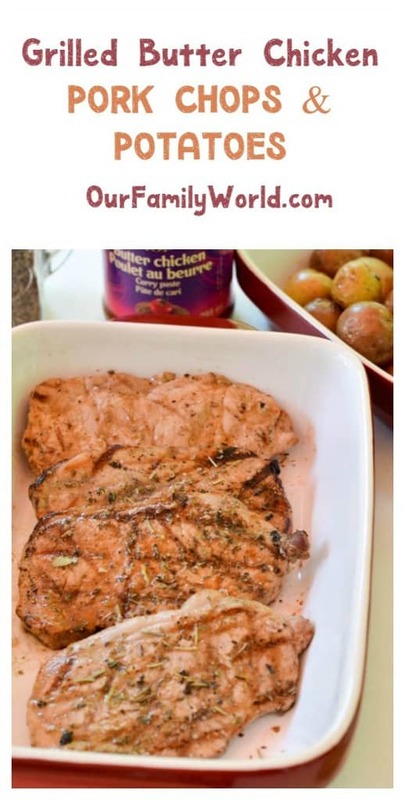 You have to try these delicious grilled butter chicken pork chops and potatoes! So good and so fast to make! It’s perfect for those nights when I need to have dinner on the table fast, like soccer night! This year marks my daughter’s third soccer season. She loves the game, the friends, and of course the popsicles at the end of each practice! I love to sit down and watch her play while chatting with other parents! It is a great social activity for both of me. It is also relaxing: I get to sit down for one hour straight, doing nothing! Talk about a treat!! However, this comes with a challenge: I have to get my daughter to the field at 6 pm twice a week! Since she will be burning energy, I must provide her with a balanced meal that will keep her going without weighing her down. Proteins and vegetables fulfill these requirements. Since I don’t feel like turning on the oven during the summer, I usually go with grilled meat and vegetables. They are easy to prepare! And as a Patak’s Canada ambassador, I always mix a little India in my cooking! The Patak’s pastes and sauces are perfect to marinate the meat. They provide that much-needed kick! For this month’s challenge, I decided to go with grilled butter chicken mini pork chops and grilled potatoes. Why mini pork chops? Because they are enough to fill my daughter’s belly without making her feel sluggish and so quick to grill! Besides, my butcher has the best pieces you can find! They are so juicy! I sometimes use the rest in sandwiches (similar to a steak sandwich, mouthwatering). Now let’s see how you can prepare this easy summer bbq meal! 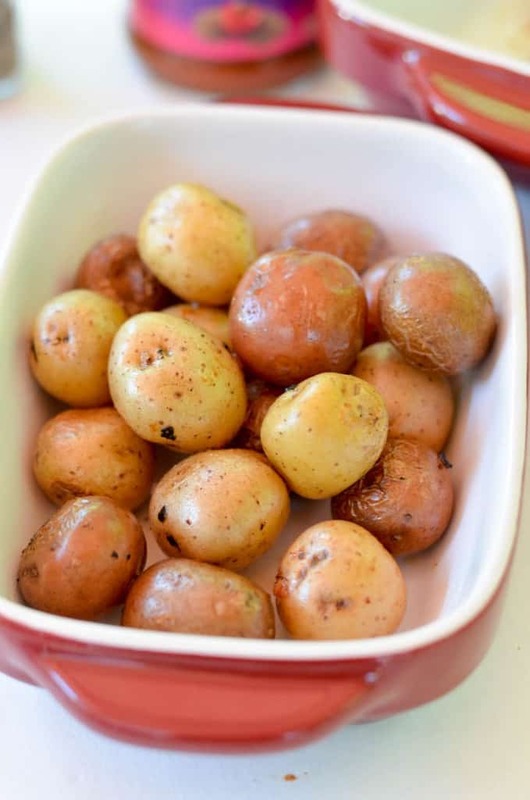 2 cups of mini potatoes. You can go with regular ones, but I find these perfect for the BBQ: Small and you don’t need to peel them! They are a bit more expensive, but they are totally worth it! (The following quantities will depend on the portions of meat you have. The trick is to use olive oil in larger quantity, then Patak’s Canada paste, then lemon juice). In a medium bowl, mix the marinade ingredients. Use 3/4 of the marinade to marinate the meat. Make sure to coat well. Store in an airtight container in the fridge for at least 4 hours. Store the rest of the marinade in the fridge. We will use it to coat the potatoes. Once ready to grill, fire up the BBQ and grill your meat. Coat the potatoes with the marinade. Add olive oil if needed and grill in the BBQ. I don’t put them directly on the grill. I use a vegetable dish suitable for the BBQ. It costs around $15 and is totally worth it. Let the potatoes grill for about 25 minutes. You have to make sure that potatoes are almost ready before adding your meat. Since we are grilling mini pork chops, it takes few minutes to grill! You want them juicy not dry! 2 cups of mini potatoes. You can go with regular ones but I find these perfect for the BBQ: Small and you don't need to peel them! They are a bit more expensive, but they are totally worth it! The following quantities will depend on the portions of meat you have. The trick is to use olive oil in larger quantity, then Patak's Canada paste, then lemon juice. Once ready to grill, fire up the BBQ. Coat the potatoes with the marinade. Add olive oil if needed and grill in the BBQ. I don't put them directly on the grill. I use a vegetable dish suitable for the BBQ. It costs around $15 and is totally worth it. Let the potatoes grill for about 25 minutes. Voilà! As easy as that! What can I tell you? I made a huge mistake: I should have doubled the portions because the kids were fighting over the meal! They barely left me a bite to test try! It was juicy, well seasoned and simply delicious. For those who are concerned being spicy, it is not spicy at all. It is just well seasoned. I even coated some of my meat with some Pataks’ Canada curry paste! And the potatoes were mouthwatering too! While you have your grill out, whip up these delicious grilled veggies to go along with your meal! They make a great appetizer for all those summer parties too! 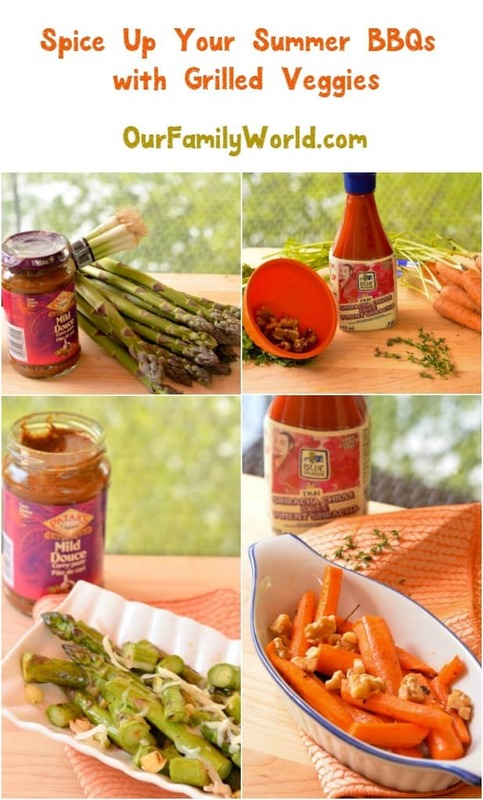 Head over to Pataks Canada to check out more delicious, easy summer BBQ recipes! Follow on Facebook and Twitter to keep up with all their exciting news! Do you have a favorite easy summer BBQ recipe? Share in the comments! I am part of The Cultured Kitchen Ambassador program in partnership with Patak’s Canada and Blue Dragon Canada and I receive special perks as part of my affiliation with this group. The opinions on this blog are my own. I’ve never heard of this, but it looks delicious!! Thanks for sharing at Welcome Home Wednesdays! Wow,thanks this sure looks like a recipe my family would enjoy. This sounds so delicious! And I love not having to turn on the oven during the summer. Thanks for linking up with Merry Monday this week! This sounds so yummy! Butter chicken is something that I was not even aware existed but it sounds delicious. 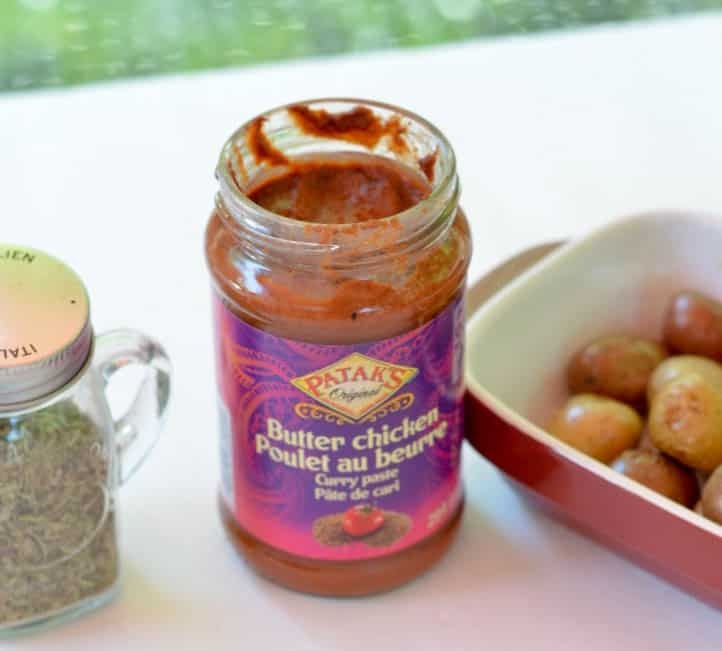 I haven’t seen Patak’s Canada Butter Chicken Curry Paste at my local supermarket, but I will definitely keep an eye out on my next shopping trip, the chops and potatoes look delicious! I dont eat pork but if I did you made it look great. I could substitute pork for chicken breast. I am with you in opting for grilled meats and vegetables. One of my favorite things about summertime is barbecuing! Those pork chops look delicious. YUM! This looks like a great dish for a summer bbq. Maybe a summer party idea? Saving it! I must say that looks great. It also seems a bit different for a summer bbq recipe. That’s what I like even more! Everything about this meal sounds amazing. I haven’t had grilled butter chicken in ages. I might have to try to convince a certain someone we should make it this weekend while we are grilling! That Patak looks like it will surely bring a fresh, delicious taste for my chops. I’ll have a lot for my own and this recipe really fits my needs for my Friday dinner menu! This is a recipe I need to try. I love to grill as much as I can and I am always looking for new recipes. My favorite is grilled veggies. I love butter chicken… but I’ve never made it myself. I am going to pin this and attempt it! This looks so so good! I love to find new things to make on the grill! 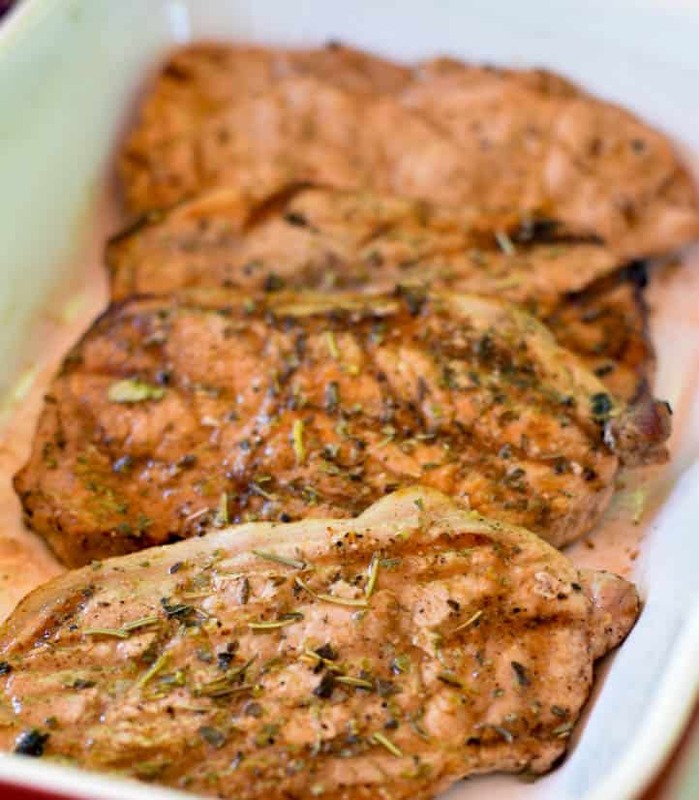 I love to marinade my chops so I will have to try this one for sure! Oh, this is so nice. I want to try this recipe, my hubby loves pork chop and my son loves potatoes. These sound absolutely delicious. We are always looking for new things to grill. Yum! This sounds like an amazing family dinner. I think we’d really enjoy those marinade flavors. My daughter’s boyfriend eats almost nothing except pork chops. I will definitely have to try this delicious sounding recipe the next time he is over since I am running out of ways to cook them lol. We love Butter chicken! Never thought of having the sauce on pork chops I gotta try it! They have the best sauces! I have never tried this one, but it looks so yummy! Perfect for summer time! We are a family of curry lovers, so this recipe would be a real hit around here. I appreciate not having to turn on the oven and create more heat throughout our house too! What a delicious meal idea, I will have to make this soon! With the heat wave we are having, there’s no way I want to turn on the oven. These grilled pork chops look like an awesome addition to our summer meal plan. I love butter chicken! This sounds like a really yummy twist on it. Who doesn’t love grilling in the summer? I’m a big fan of pork chops! We usually like to go the thin route and grill them. This recipe sounds so delicious! Our family loves pork chops. We usually eat mashed potatoes. I can’t wait to try this variation on my family. This is a recipe my family would love. I will have to get the ingredients I need to make this on the weekend. We love grilling and we almost always have grilled vegetables with our grilled meat too. I’ve never tried the Patak’s Canada Butter Chicken Curry Paste yet though. Sounds good! I have to say that this is a first for me to see as well. But definitely something I will have to try and I’m sure my husband would love, love, love this!! This looks so amazing. I am always looking for ways to spice up dinner when we grill it (which is almost every day during summer). Yum! Yummy! We love butter chicken with nan bread and coconut rice. The flavours are a little strong but the dish is delicious! Normally we make burgers on the BBQ but you have inspired me to whip up a batch of pork chops. I’ve never heard of Butter Chicken before, but your chops and potatoes look great. I’ll have to get some of that this weekend.